Your clothes can help you look younger, thinner, wiser or older. Dress and styling secrets, when used correctly, can help you achieve your image goals for the desired effect at work. In this guide we will discuss some easy ways to dress for success. Instead of dressing for the job you have, dress for the job you want. If you are going for a job interview, know that your first impression is the last one. So dress right and spend money on creating a professional wardrobe. Invest money on a suit or a dress. A good suit can last you for decades and you can wear it on multiple occasions. Do look for deals around the Holidays to save money, if you are on a tight budget. These days, you can shop online though you’d then need to get the suit or dress fitted. Seeking assistance of a sales rep can also help you shop for pieces that are versatile, in vogue and look good on you. Do you already own pieces you can wear, that look good on you and make you feel confident? This way, you only need to shop for fillers. For example: you might already own a couple of decent shirts and pants but need to shop for belts, ties or other accessories. This way, you need not spend too much money but still amp up your wardrobe. For women the essentials include: a black pencil skirt, trousers in beige or black, black or neutral pumps and an elegant handbag. For men, the essentials include: Button up shirts, dark and light slacks, dark dress shoes, belt and briefcase or laptop bag. Specifics for women are: Pants or skirts with a matching jacket in wool or wool blend. Go for colors like navy or black or grey. Choose a conservative though versatile style. If you are going for patterns, go for muted ones. In shirts, the best material is cotton or cotton blends. Always select long sleeved shirts compared to short sleeved ones. Go for turtle neck tops and muted, pastel colors. Whatever you choose, make sure it covers you well. Keep skirts at modest length. Specifics for men include: Pants with matching jacket, ideally in wool or wool blend. Select grey, black, navy or charcoal. Go for shirts in cotton or cotton blend. Accessories can make a huge impact on your overall look. Both men and women should avoid too much jewelry. Women: do not wear dangling colorful earrings. Keep rings limited to one per hand. One may wear broaches to add a bit of color to the formal office-wear. Shoes must be clean and polished. You can go for neutral pain hosiery and handbags that match the scarf or outfit. Men: select ties that reach the top of the belt buckle. Ties ideally should be made of silk and complement the suit. 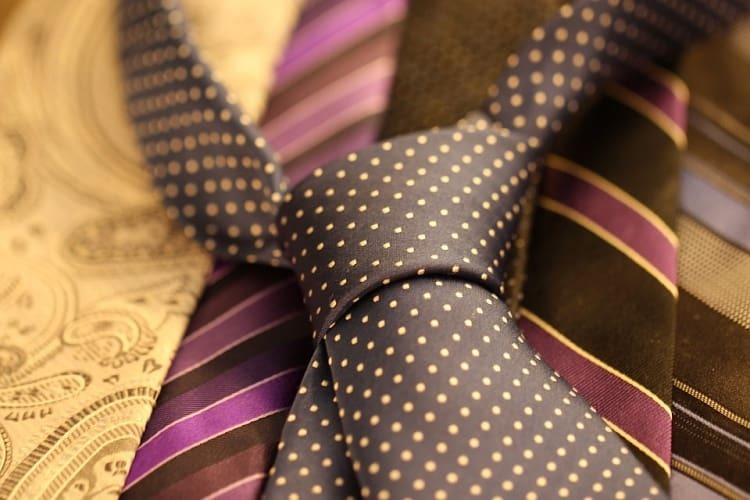 Ties may have small geometric patterns. Go for socks in the same color as that of the shoes or slacks. If you have tattoos or body piercings, keep them covered. The only piercing that are allowed, for women, are ear piercings. Think carefully before getting any work done. For women: Keep the hair out of the face. Color the nails in neutral color or not at all. Keep nails clean. Avoid using too many makeup colors which can be distracting. Keep makeup current, appropriate but never overdone. For men: Avoid beards and mustache. If you must, keep facial hair well groomed. Keep hair short. Get a good hair cut. Keep nails, hair and teeth well maintained. Understand the rules pertaining to dress code for casual Fridays as well as other days of the week. To be on the safe side, keep a pair of shoes, a handbag or a suit in the office in case you have to meet new clients. Women can carry basic makeup items to go from day to night in case you decide to go for drinks later or have to meet clients. This is the rule of thumb to know when shopping for business attire. The way you dress represents your organization. So do now wear something you are not clear about. The goal of a business professional should be to look the best one can. Men and women: maintain a low-maintenance hairdo. Identify the parts of your body that you like and ones you do not. Accentuate your positives. Use sleight of hand: vertical stripes make you look taller and slimmer, lighter colors will make you look larger and chunky shiny textures will make you look bigger. Your appearance is the first thing your potential employer or clients will consider about you. It is a well known secret that women who wear makeup are more likely to get hired than those who do not. Likewise, men who dress smart are often preferred over ones who do not. So, make sure you put your best foot forward and use these tips and easy ways to dress for success!